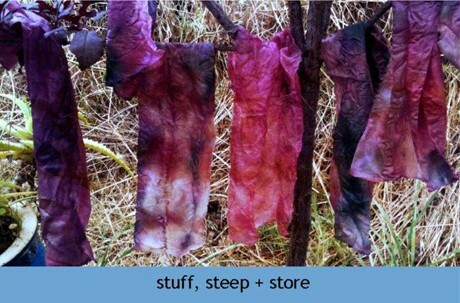 The dark one are silk pieces dyed in different onion shells , now wrapped with pines from Denmark and wild strawberrys leave + rust in the bottle. 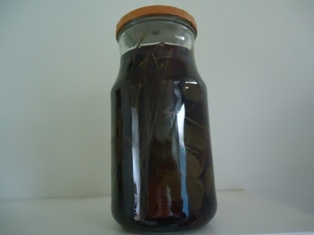 The next one I have to confess , this are the first time I do not have success with silky merino jersey , I have got some euca leaves from florist it do not manage the first time in jar ,later overdyed in indigo bath and now wrapped with wild strawberrys leave , have been in jar for some time . 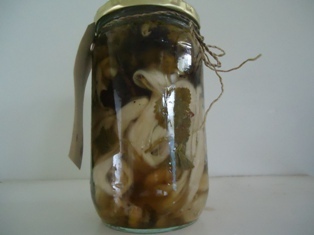 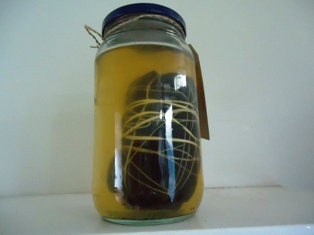 The third one are ramie fibre pre mordant in tea, in the jar with a piece of bark , wild strawberry leaves which are my favourite at the moment and flowers from coltsfoot, have been in jar for some time .